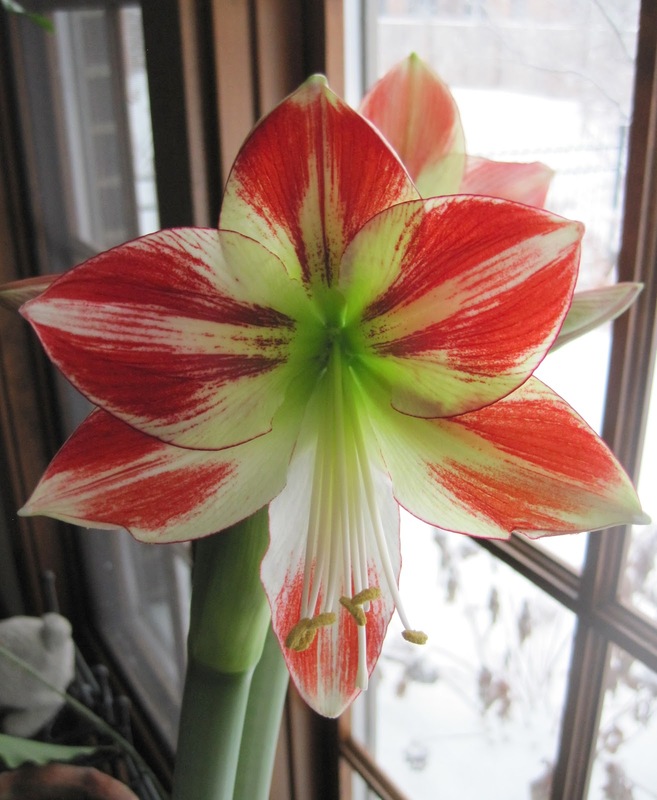 Quickly now, do you know another common name for Amaryllis also known as Hippeastrum? Did you just answer Knight's Star Lily? Correct! How did you know that? I didn't know it until I began reading through Dreer's Hints on the Growing of Bulbs, published by Henry A. Dreer, Incorporated, Seeds, Plants and Bulbs, 714-716 Chestnut Street, Philadelphia, copyright 1914. Reprinted and Enlarged, 1915. Reprinted 1916. Reprinted 1919. Reprinted 1920. "Written by our experts and including a number of cultural notes by the well known Horticultural Writer Miss Ida D. Bennett and Others. Cost when published -- 50 cents. Now you know how I came to acquire this guide, having searched the Internet to find good copies of all the gardening books written by Ida D. Bennett. It's a paperback book, just 80 pages. When I got it, I was excited to find that someone had tucked a newspaper clipping in it, along with several small pamphlets, two on planting, one on pruning. The newspaper clipping has no date on it but is a column written by George Abraham titled "Trim Shrubs Now to Bring Fresh Flowers in Your Home". There is no hint about which newspaper it was in or when it was published other than a note that you could send a self-addressed envelope to George in care of The Star... hey, they call our local paper, The Indianapolis Star, "the Star". I wonder if that's a rabbit hole I should go down now? Even in 1920, they referred to it as (Amaryllis) or (Hippeastrum), so not much has changed, except somewhere along the way, I believe we lost the common name of Knight's Star Lily. Or, I should, say that I never heard this flower referred to as that. The cultural instructions in 1920 are just about the same as they are today. Plant the bulb in winter when received, leaving most of the neck of the bulb uncovered. Water, let it flower, then keep watering it through spring and summer. You can take it outside if you wish and put it "in a sunny border". Stop watering it in early fall so it goes dormant, and bring it back inside. Start watering again in the winter time, about the time you would have planted the new bulb and wait for it to flower again. It is not necessary to re-pot it each year, but if you do repot it, the best time, according to Dreer's, is in the early summer when you take it outside. I think he made that name up. ;^) I'm going to water my amaryllis, in hopes that it will do something. I was waiting for the green leaves to die down, but they still haven't. After having our house repainted a couple of weeks ago, I've been reshelving our books. When I got to some of the old garden books, I kept wishing you were here to share them with me. And, yes...I've also found clippings from other people in some of mine. I buy a lot of used books. What treasures! Oh what a pretty flower. I want one.